Sergio Aguero produced a delightful finish as Man City stormed into a 2-0 lead at Fulham after just 26 minutes following some poor play from the hosts. Fulham conceded possession cheaply in the build-up to the first goal after just five minutes, as Bernardo Silva gave City the lead. Having slowly worked their way back into the game after a relentless effort from the visitors in the opening stages threatened to ensure that it could get ugly, Fulham undid their good work again with poor play at the back. 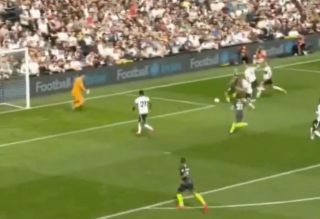 Joe Bryan was guilty of giving the ball away, and as seen in the video below, Aguero made no mistake after being put through on goal as he produced a classy finish to double Man City’s lead. With Liverpool not in action until Sunday against Tottenham, securing all three points at Fulham will undoubtedly pile the pressure on their Premier League title rivals to respond as they also still have a game in hand. "The last person you want to give an opportunity like that to is Sergio Aguero… deadly as ever!"